With summer well under way, there are a number of things we can do around our home to minimise the impact of pests in our lives. Make sure that your furry family members are all up to date with fleas treatments. If you’re not sure ask your local vet for advice. Keep you lawns cut short and make sure that you keep long grass back from the fence lines to avoid tick problems around your place. Wash pet bedding in hot water on a regular basis to keep fleas under control. If you walk your pet, make sure you check them for ticks every time to come back (especially if you been wandering through bush or longer grass. Don’t leave uneaten food in pet bowls. This encourages ants and rodents to hang around and maybe move in! Check eaves and brickwork for wasp nests and spiders. Be particularly cautious of redbacks. Make sure there are not large gaps (6mm or more) in the eaves leading up into the roof void – leaving a highway for rodents to find a new home. Make sure doors are well sealed to keep rodents out (not just the rainy weather). Pay special attention to garage doors and sheds – then commonly don’t close up all that well and rodents love these areas. Keep bins away from the immediate vicinity of the home. Keep them as clean as possible and wash them out regularly. Keep them well sealed. They are source of flies and can encourage rodents. Foliage against the house can create a highway for ants, rodents, spiders and termites. Make sure that bushes and shrubs are kept well away from the walls. Trim off any tree branches that overhang the roof and gutters. Look out for redbacks. If you discover them you can attempt to remove them yourself (don’t get bitten) and take down the webs and egg sacks. If you’re not sure – call us for help. Make sure that water containers are emptied. This includes pot plant reservoirs. Any container that holds water (where levels rise and fall) will encourage mosquitoes to breed. Keep an eye out for drains that hold puddles, car tyres and old buckets that everyone forgets about. Make sure that your home is properly screened. This will keep invasion from cockroaches, flies and mosquitoes to minimal levels since they all love to fly inside to explore and find new ‘digs’. Got more pest control questions or need some help? As we move into the warmer months of the year, one pest that will be commonly found across all areas of Australia is the Redback Spider. The pictures shown here were taken at a home recently, where our technician counted over 20 females around the home. If left untreated that’s potentially many more spiders in a couple of month’s time. Redback Spiders are easily identified due to their distinctive body colours and shape. They are usually black with a distinct orange or red stripe on the upper side of their abdomen and on the lower side is usually an orange or red hourglass shaped mark. Some females can be a fawn colour. The size of a female can be 12mm-15mm and larger females can easily span a 50 cent coin. Males differ from the female in both size and colour. Males are much smaller and are rarely seen. They are brown and usually have white markings. Redback spiders are commonly found living in close proximity to human habitation and tend to favour outdoor areas. They generally construct a strong untidy web close to the ground with the spider usually hiding in a sheltered are at the top or corner of the web and wait for insects or small lizards to stumble into their webs. They favour dry places around buildings, under outdoor furniture, toys that may have been sitting outside for periods of time, stored/cluttered items, pot plants and the like. 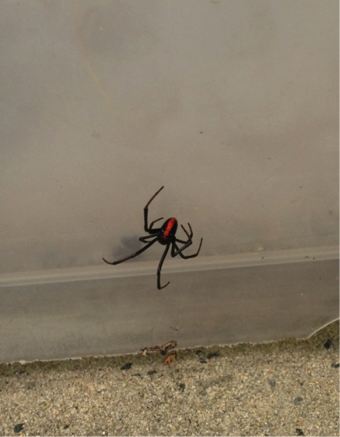 Redback Spiders can also be commonly found in sheds amongst stored items like boxes and other clutter, and garages. A common belief is that they will always be found at ground level however they can also be found within roof voids and gutters. 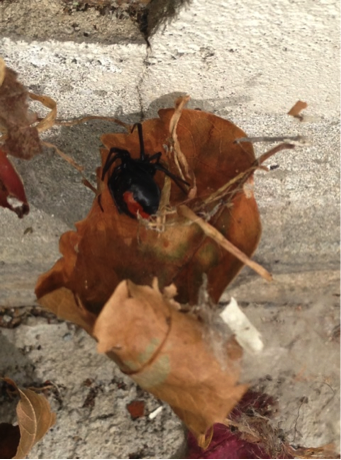 Some of the biggest Redback spiders I have seen have been in guttering of homes. Be aware of this when getting leaves out of gutters. Wear gloves. A common belief is that they will always be found at ground level however they can also be found within roof voids and gutters. Successful treatment for Redback Spiders will rely on a good inspection. As these spiders are very good at exploiting many different areas around your home, identifying areas where they are prior to treatment is essential. Like all webbing spiders our treatment will rely on direct contact with the spider or its web. Seeking out all areas externally and treating accordingly is the first step. Other areas that will need to be treated for this spider are roof spaces and wall cavities. When a good infestation is present externally they will often be found in weep holes and roof voids. A lot of insects enter these areas so it is a great place for Redback Spiders to construct webs. If sub-floors are present at your home they will also be treated. I have seen sub-floors literally full of Redback Spiders. A female only needs to mate once after that can produce eggs for up to 2 years laying new batches of eggs every 3 weeks or so, we need to make sure that all spiders living around the home are treated properly in order to protect you and your home from these spiders. Remove all webs from structures, under eaves and backyard equipment such as swings, trampolines. Store children’s toys in one location, preferably off the ground – always take care when handling toys after storage. If you would like more information on how to manage Redback spider control at your property, call Amalgamated Pest Control.